Lauri Markkanen has a game winner, that being his three pointer with 49 seconds left Thursday night that basically clinched the Bulls first victory of the season, 91-86 over the Atlanta Hawks. 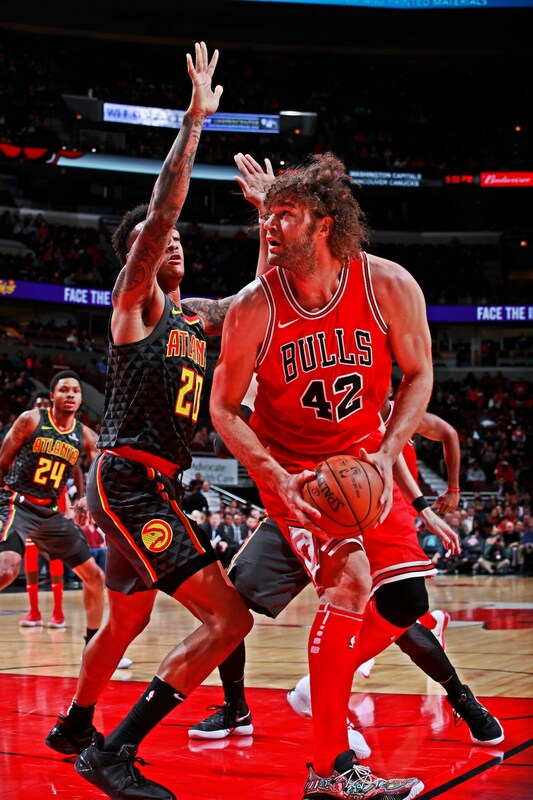 The shot came with the Bulls clinging to a one-point lead after the Hawks overcame an eight-point fourth quarter deficit and took a lead with under two minutes left. 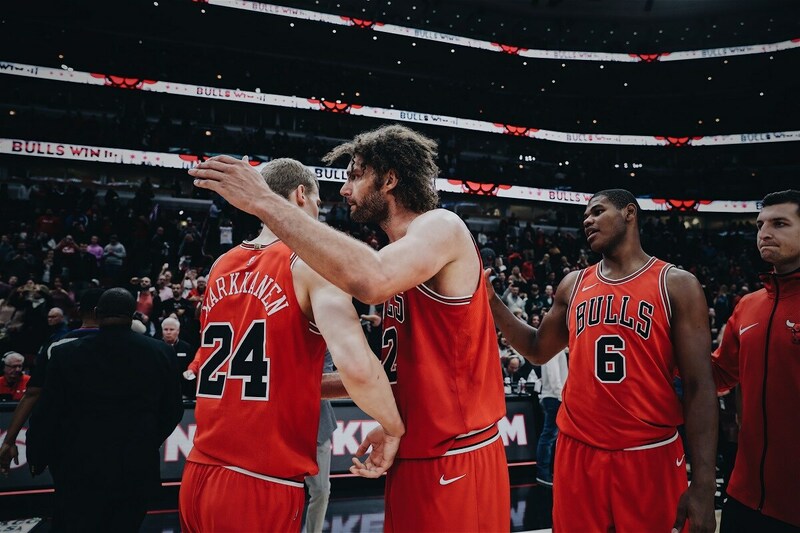 Markkanan finished with his second double/double of the season with 14 points and 10 rebounds and is now averaging a double/double at 15.8 points and 10 rebounds. He’s scored in double figures every game in the Bulls 1-3 start, the first Bulls rookie to do so since Derrick Rose, and Markkanen leads the team in three-point shooting at 40 percent with a rookie record 12 threes in his first four games. And wait until he turns 21. That’s the word for Markkanen, who has gone from project to prodigy in barely more than a week. The Bulls, hard working if not efficient, again varied the scoring with six players in double figures led by Robin Lopez with 16 points. 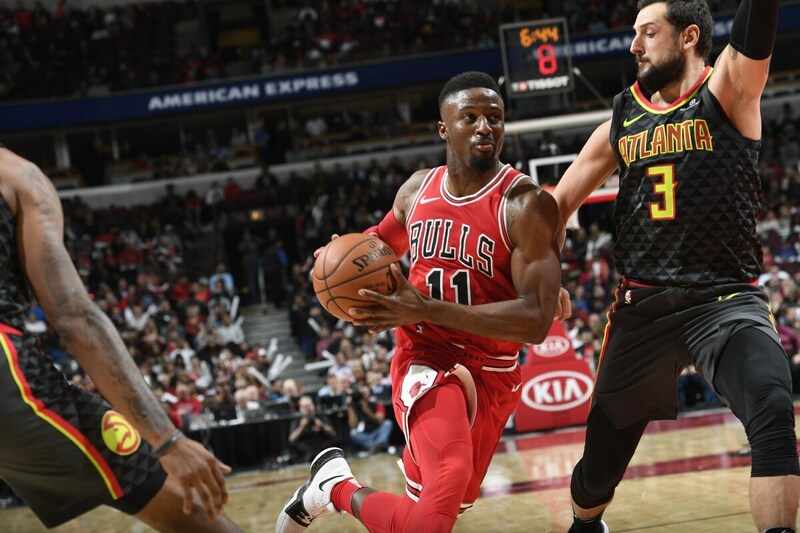 David Nwaba off the bench hustled his way to his first career double/double with 15 points and 11 rebounds and Justin Holiday added 13 points and 10 rebounds as the Bulls had a massive 62-40 rebounding margin. The Bulls also finally made it inside with a 46-20 edge in paint points and 29 free throw attempts. The Bulls had 41 overall in the first three games. Meanwhile, the seven footer from Finland who was the seventh overall pick in last June’s NBA draft from the Jimmy Butler trade is proving a blessing and a relief for the Bulls after the preseason altercation between Bobby Portis and Nikola Mirotic and the wait for the return of Zach LaVine and also Kris Dunn with his preseason injury. Not that Markkanen’s play can deliver the Bulls into immediate contention. But his remarkable early season performance as a 20-year-old who played all summer for his national team is something of a revelation. The Bulls were excited about his potential, but they expected him to be weary from the summer and take some time to adjust coming off the bench. The Portis/Mirotic incident expedited his place in the starting lineup, and it’s difficult to see him giving it up now the way he has played as one of the top rookies in what is considered an elite class. He’s talking the talk, walking the walk, backing it all up. It was an unsteady start for Markkanen, a blocked shot early, his shot coming up short and left. He looked like Doug McDermott in the United Center, pressing so hard for the ball to go in as the home crowd gasped in expectation every time Markkanen shot. He was one of eight overall in the first half, one of six on threes as the Bulls trailed 39-37 in a brutally poor half for both teams, the fellow rebuilding Hawks now 1-4. Lopez was the Bulls defender and deliverer in the first half, scoring 14 first half points, 10 in the first quarter on five of 10 shooting. This season continues to be a rare offensive explosion for the defensive big man. But 10 shots in a quarter? Robin Lopez? Lopez didn’t think he’s attempted that many, even as a kid. You’d think it wasn’t that difficult to figure out: One thing isn’t working, try another. But it doesn’t happen that often. Markkanen’s shot wasn’t going in, so the kid in the third quarter drove and scored on a finger roll and with a two handed dunk, swinging on the rim for emphasis. The Fin can finish! With that strong third quarter led by Markkanen’s basket banging barrage, the Bulls led 65-59 after three quarters. But former Bull Marco Belinelli with a game high 23 points for the Hawks led a fourth quarter Hawks run of three three pointers and an 11-2 spurt in 90 seconds. Suddenly with six minutes left the Bulls trailed. The Bulls got the lead back on some aggressive play from Jerian Grant and Denzel Valentine, the latter starting for the injured Paul Zipser. But Belinelli struck again with a pair of threes to give Atlanta an 86-85 lead with 1:48 left. It was looking like a long oh-for to start the season with Oklahoma City Saturday and then to Florida next week. Lopez then found Holiday cutting for that baseline reverse and a one-point lead with 1:35 left. Mike Muscala missed a three and then it was Lauri-mania. A similar play hadn’t materialized previously. Grant carried the ball up court and you could see Markkanen pointing and apparently calling the positioning and the play. “He’s very poised as you can see,” said Holiday. Markkanen went to the right baseline off the lane, signaled across court and then angled toward the top off the floor. Muscala came out with him to clear and Grant moved to the right baseline, where he missed a 16 footer. The rebound went off the Hawks. The Bulls with a minute left set up for the inbounds pass from Grant. Markkanen was in the right corner. Valentine just barely caught the pass in and handed off to Grant. Markkanen moved up to set a screen on Malcolm Delaney defending Grant. Muscala hesitated and it was too late. Grant threw cross court left to Markkanen popping out on the wing. 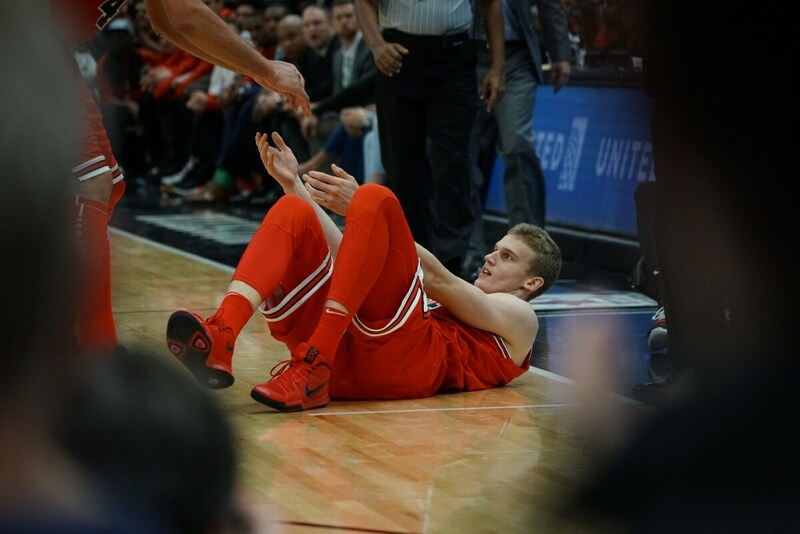 Markkanen had not taken a shot in the fourth quarter yet and had not attempted a jump shot since three minutes into the third quarter. Markkanen’s 26 footer went right down, flushing the Hawks with it. It was 90-86 Bulls with 49 seconds left. “No hesitation at all,” Markkanen assured. “I work on my shot. Today, it wasn’t falling early on, but I still believe in my shot. We knew how they were going to guard the pick-and-rolls. I slipped in there and it was a wide open shot. I knew I was going to be open. I knew before I got the ball that I was going to shoot it.